My earliest memory about Berlin wasn’t Berlin itself, but a Laser Disc of Herbert von Karajan conducting the Berliner Philharmoniker, performing Beethoven 6th symphony. The way Karajan made music film was peculiar: all the musicians were lined up perfectly, all the bows and violins were aligned, all the flutes were tilted at the same angle, and so on. When they played, the body movements, other than the movements necessary to make some sound on their instruments, were minimal; in fact, they looked so rigid that it was as if Karajan were directing a team of robots. But I was small then, and I had never been to any performance of truly great orchestras, so I was impressed and fascinated by what I saw—how could they look so synchronous to each other?—and I spent a lot of time wondering how those images were capture in an actual concert. Of course, they weren’t recorded from an actual concert: many years later, I learned that Karajan would record the sound with the orchestra, and they mimed the sound recordings afterwards, sometimes months or even years later, giving Karajan the opportunity to perfect the visual effect according to his own aesthetic, which was perfectionist, yet artificial, manipulated, and unreal. Ironically, it was also many years later that I realised, despite his apparent perfectionism in those videos, that when it comes to the sound recordings, Karajan was rather unconcerned about imperfection, very much contrary to what a lot of people thought about Karajan. Only a few days ago, I was listening to his recording of Eine Alpensinfonie, and in the middle of the movement Der Anstieg, the violins and violas were not together at all. Nowadays, an imperfection such as this would have compelled any recording producers to demand another take, yet mistakes made by Karajan and the Berliner Philharmoniker have been immortalised by recordings. My opinion on Herbert von Karajan is ambivalent: on one hand, he was one of the greatest conductors, under whose baton the orchestra produced the sort of sound unmatched by any one before or since; on the other hand, the sound he sought was unambiguously Karajan’s, and was applied to every kind of music he performed, even when it was inappropriate. Nevertheless, when his vision for the sound happened to be suitable for the music, the result was almost life-altering: towards the end of Eine Alpensinfonie, in the movement where the peace returns to the Alps after the storm, the sound of string tutti was so deep and so rich that it gave me goosebumps, and it was the only recording of the work that gave me such chill. The Philharmonie, the home base of Berliner Philharmoniker, is located near Potsdamer Platz. Before the division of Berlin, Potsdamer Platz was the centre of Berlin, but after the division of Berlin, the Berlin Wall, or Berliner Mauer, ran right into the middle of it. Since then, Potsdamer Platz became a no man’s land, and the Berlin Philharmonie, the construction of which began before the erection of the Berlin Wall, found itself pressed right up against the wall after its completion, and for almost three decades, the Philharmonie was situated at the edge of West Berlin instead of the centre of a great city, as it should have been had it not for the Wall. To go to concerts in the Philharmonie as a West Berliners, you would have to travel to the border of your land, where just a few hundred yards away lived the people of another country, where guards were standing in the watch towers, ready to shoot any one trying to defect. Berlin Wall was meant to prevent East Germans from defecting to West Germany. Before I learned the Geography of Berlin, I had always had the false idea that the Berlin Wall trapped the East Germans inside while the huge world of freedom was on the outside. The reality was quite the opposite: the Berlin Wall encircled West Berlin, making West Berlin an absurd Island surrounded by the Deutsche Demokratische Republik (funny that East German’s government called themselves a “Democratic Republic”), while the Bundesrepublik Deutschland, or West Germany, was hours away by train. It was freedom inside the Berlin Wall, a tiny beacon of hope inside the darkness. Berlin Wall wasn’t the first large wall built at the border: the Romans built the Hadrian’s Wall, the Chinese built the Great Wall of China, the Israelis built a wall to separate themselves from the Palestinians, and a certain so-called politician in the United States wants to build a wall at the border with Mexico. The Chinese Wall was particularly fascinating, for it began its life some two millennia ago in the Qin Dynasty, and for the next one and a half millennia or so, different governments had built new walls on top of the old ones, linking them, strengthening them, and perfecting them. The image of the Great Wall of China as we know it today is of the fortification constructed during Ming Dynasty. The objective for building the Great Wall was always to fend off enemies from the north, and it was so monumental, its design so ingenious, that it was impossible to breach in a normal warfare of those days unless a mole opened the gate for the enemies. Barbarians, they were; or so they would have been called, because the Chinese thought they were superior, and they still do. Patriotism and nationalism, while backward and dangerous, arises from a natural tendency inside the human psyche, so instinctive that without education and exposure to different cultures and environments, a person is bound to harbour such beliefs. The last time the world saw a sharp right-turn in global politics was during and in the aftermath of the Great Depression, most notably in Germany. Crushed by falling living standards, people were easy to be persuaded by the Jewish conspiracy. A convenient scapegoat was found, and Hitler carried on with such politics with apocalyptic consequences. What is interesting, to me, at least, is that although the divide between rich and poor is rising around the world, the global economy is arguably not in a recession, not to mention a depression, or a great depression. So why is now the time to look for scapegoat for people’s own problems? Why is now the time to embrace nationalism, which has been proven to be an illness to humanity? Is it simply the rise of Islamic extremism? It is true that many of the atrocities committed in the past few years, the purpose of which were to incite fear around the world, were done by Islamic terrorists, though to infer from this statistics that “all terrorists are Islamic, thus we need to ban them from entering” is a lazy logic. In 2011, a man put a bomb in Oslo, Norway, killing eight people; after which he sailed to an island—where a summer camp for young people, organised by a political party, was held—and shot sixty-nine people dead. That man was unapologetic and dangerous, but he wasn’t a Muslim; in fact, he was more of a Christian fundamentalist. His name is Anders Behring Breivik. Anyone can become a terrorist. After the Wall fell, Potsdamer Platz became a huge building site, and the Philharmonie once again became the centre of a great city, as it was meant to be. Legend has it that the then chairman of Sony, Norio Ohga, chose Potsdamer Platz as the site for his new European headquarters for Sony because of its proximity to Berlin Philharmonie, and of all possible plots in the newly available Potsdamer Platz, he picked the plot closest to the Philharmonie. Being a amateur conductor himself and a friend of Herbert von Karajan, who died in his presence, he could go to concerts in the Philharmonie after work in Sony Centre. I’ve been to Potsdamer Platz many times over my various stays in Berlin—I went there almost every day whenever I was in Berlin—for there are some of my more favourite restaurants in Berlin, or indeed, anywhere in Germany. Being a largely new development, Potsdamer Platz is also among the most modern-looking part of Berlin, or the most un-Berlin part of Berlin. 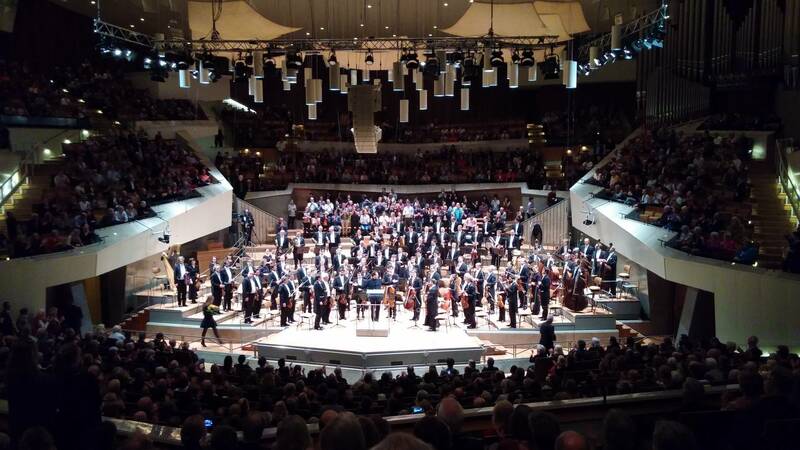 Like Norio Ohga and many other music lovers, I went to Berlin for Berliner Philharmoniker and its three opera houses. Berliner Philharmoniker is no doubt one of the best orchestras in the world, and their concert hall, the Philharmonie, has excellent acoustics. As it is very close to Potsdamer Platz, I would go to Sony Centre and have supper in one of the many restaurants before going to concerts. In the late spring and early summer, when the sun begins to set late, I would choose a table under its large, circle roof. After the supper, I would stroll to the Philharmonie. 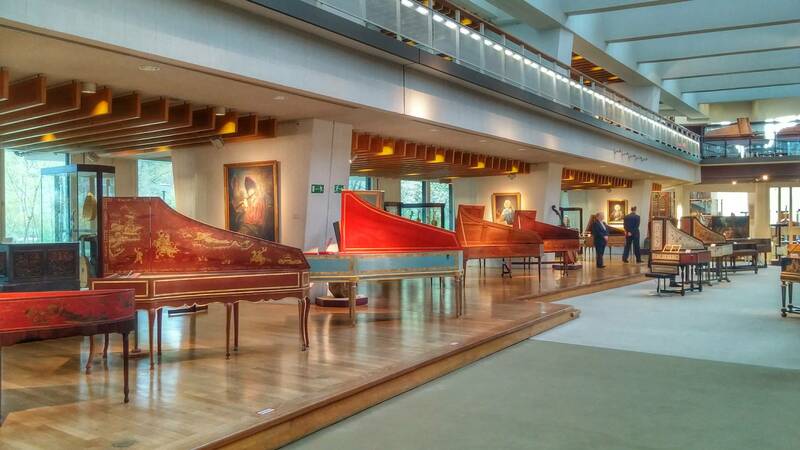 Somewhere between Sony Centre and the Philharmonie is the Berlin Musical Instrument Museum (Musikinstrumenten-Museum), which holds a collections of thousands of instruments, which large number of old harpsichords. It seemed almost like a pilgrimage when I went to the Philharmonie for the first time, just like when I attended a performance by the Wiener Philharmoniker in the famous Golden Hall in Musikverein some years ago (though the Wiener Philharmoniker is often an overrated orchestra with very inconsistent performing standard). Then the ritual began—people streaming into the hall, lights dimming down, the orchestra entering the stage, tuning their instruments, moments of silence, then the conductor striding to the stage, the orchestra stood, the conductor acknowledging the audience; the conductor now facing the orchestra, the orchestra preparing, the audience quieting down—which a ritual that set up the anticipation and, if the concert turned out to be good, enhanced the ultimate payoff. In the case of an orchestra as good as the Berliner Philharmoniker, the payoff is always tremendous and satisfying. Komische Oper Berlin has been making waves in the world of operas since Australian opera director Barry Kosky took over as the house’s Intendant. One of the most notable, successful, and inventive productions was Die Zauberflöte by Wolfgang Amadeus Mozart, produced in collaboration with British theatre company 1927. With a unique combination of Monty Pythonesque animation and silent film-like acting, the production has travelled worldwide, including Los Angeles, Edinburgh, and Asia. I knew about the production before going to Berlin, though I thought my schedule wouldn’t allow me to watch it that year, so I went to Berlin without purchasing the ticket. I was doing the very touristy thing—Brandenburger Tor tour and a stroll along Unter den Linden, the old East Berlin Boulevard—when I saw the box office for operas in Berlin, where tickets from three opera houses—Staatsoper Berlin, Deutsche Oper Berlin, and Komische Oper Berlin—could be purchased. To my surprise, Die Zauberflöte was on the menu, and the price was surprisingly cheap: just €48 for a really good seat. I couldn’t resist. Komische Oper is a relatively small opera house. The name of the house, which means “Comic Opera,” came from the fact that the opera house began its life as a venue for lighter operas and operettas; though their repertoire today is not limited to those at all. Not to long ago I saw their lush and beautiful performance of Tchaikovsky’s Eugene Onegin on the internet, and even Richard Wagner’s Die Meistersinger von Nürnberg is on the menu. Like so many operas, Die Zauberflöte’s story makes little sense, so that the charm of it comes from the music, the vocal pyrotechnic of Königin der Nacht, and the comedy, most of which delivered by Papageno, the kind-hearted but coward sidekick of Prince Tamino. The Komische Oper’s production filled in the story with spectacular and humourous animations, which demanded the singers to move in synchrony with the animation projected on the wall behind them. While imaginative and attractive, the rich visual effects had crowded out other aspects of the production, in particular the acting: as the singers were often tied to one spot (for obvious safety reason, since they were sometimes placed high above the stage), their movements were constrained, so that they were rather still while singing. As a result, the animations do most of the heavy-lifting of drawing the audience into the story. As in other places in Germany, there are constant reminders of the crimes committed by their forebears during the Second World War. The Topography of Terror (Topographie des Terror) is located in the former headquarters of the Gestapo and SS, and being at the border between West Berlin and East Berlin, a section of the Berlin Wall ran just outside it, and that section is now the longest surviving section of the Berlin Wall of the West Berlin side. Not far away from the Topographie des Terror and just one block away from the Brandenburger Tor, the Memorial to the murdered Jews in Europe (Denkmal für die ermordeten Juden Europas) occupies a vast plot of land. More than two thousand of concrete slabs of varying sizes and heights lie on a uneven land, creating an overall landscape which, when seen from a far, resembles a vast cemetery. 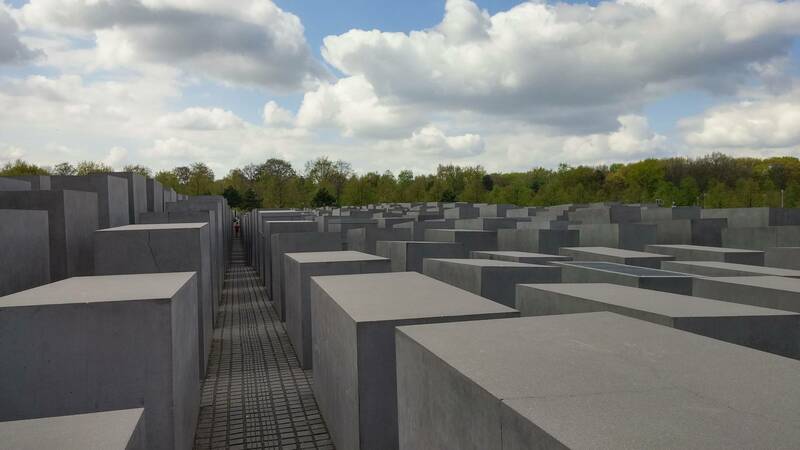 Those slabs form a rectangular grid of paths where people can walk between the slabs, disappearing behind them (some of which taller than a grown man), and re-emerging from behind them. In other cities where their people are more money-oriented, sacrificing a large plot of land in favour of putting up a memorial with no obvious financial value would have been impossible: this is Mitte, near Brandenburger Tor, where tourists stream by every minute, where embassies and government offices were located. “Why don’t you build a office building? A hotel? A shopping centre?” people from places like Hong Kong would say. The memorial wasn’t without its own controversies, from questioning whether it was necessary to have yet another monument, whether it made Jewish victims somewhat more important than many other victims of the War, to the involvement of a company with a Nazi past. But the memorial is now there as an inescapable presence. Should people be allowed to be not reminded of the tragedy of history? Should they be allowed to put the shameful history of their own nation aside and move on to the future? But what can be worse than letting the cancer that is nationalism flare up again? Leo Tolstoy was right when he wrote, in “Patriotism and Government,” that there is no “good patriotism,” as patriotism in one country feeds the patriotism in another country, both of which would have rising hatred of each other. The world would be better place if everyone lived with the shame about their own history than being ignorant about the errors committed by their past. It is surprising that I still haven’t mentioned anything about my sight-seeing of places such as Reichstag, Brandenburger Tor, or Alex Tower—the touristy things. The more I think about it, however, the more I notice that for each given city, there are very limited touristy things one can do: in London, on visits the Tower Bridge, Piccadilly Circus, Covent Garden, Leceister Square, the House of Parliament, the Big Ben, the British Museum, and the National Gallery; in Paris, the Eiffel Tower, Arc de Triomph, Louvre, and Montmartre; in Hamburg, Speicherstadt, Landungsbrücken; in Köln, the Kölner Dom. If one goes on a journey with an attitude of ticking all the boxes on a checklist of famous spots by way of taking a selfie in front of those places, then there aren’t very many things to do in any given big city. A picture taken in front of the Brandenburger Tor is enough an evidence for your having been to Berlin, and that takes only a minute. Likewise, for someone not exceptionally adventurous, a picture from the Peak would be a sufficient proof that you’ve been to Hong Kong. I’ve been to Berlin more than once, and other than my first time there, I didn’t bother to visit Brandenburger Tor other than when I changed buses Unter den Linden. I hate queuing, so I didn’t go to the glass dome of the Reichstag or the Alex Tower. Likewise, I can’t imagine a Berliner going to Brandenburger other than for transit, or Parisian going to Eiffel Tower and Champs Elysees, or, for that matter, a Hong Konger going to the Peak other than accompanying a foreign friend. When I re-visisted Berlin, I would sit at a bar and watch football while having a beer; or have a tour of the shopping areas and look for things that weren’t souvenirs; or sleep in until the sun was well above the head like it was a lazy Sunday at home. I was trying to not live like a tourist, and I guess I’ve succeeded to a certain extent.